The take away lesson from the 1972 made-for-TV movie Crawlspace is simple: don't take in strays. 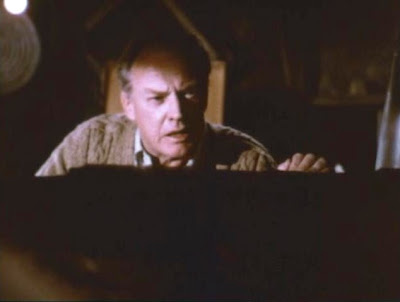 Directed by the late, great John Newland (One Step Beyond, Don't Be Afraid of the Dark), Crawlspace is the unsettling tale of an elderly childless couple, Albert (Arthur Kennedy) and Alice Graves (Teresa Wright), who decide -- with almost no debate, really - to allow a young, unshaven stranger, Richard Atley (Tom Happer) to move into the crawlspace beneath their kitchen. The Graves know virtually nothing about Richard save that he is really good at chopping wood, and currently unemployed. Why would two seemingly sane adults make such an odd and rash decision involving a stranger in their own home? Well, the answer to that interrogative is part of this TV movie's unique and disquieting charm. The Graves live lonely, isolated, regretful lives, and Alice wishes the couple had raised children. Biologically speaking, that ship has sailed, but the odd, vulnerable Richard provides Alice a surrogate for her desires. As Albert notes late in the proceedings, Alice took the young man to her "bosom in some crazy menopausal fantasy." But at first, Albert attempts to reject Richard, when the homeless man first shows up in the crawlspace of his remote, country house. Albert puts a padlock on the cellar door when Richard is out in the woods. But Richard returns, breaks the lock, and scrawls the word "God" on the cellar door. 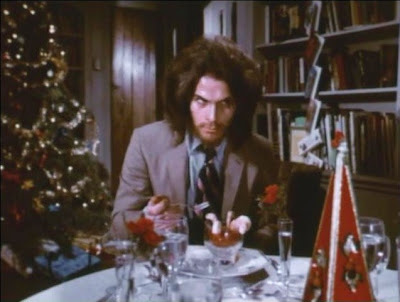 Instead of calling the police, or even insisting that Richard leave their crawlspace at once, the old Graves then start showering their weirdo "lodger" with gifts: a new suit and home cooked meals. They even invite Richard to Christmas dinner. After Richard has moved in, Newland shoots a series of scenes in the basement, where Albert talks meaningfully with the off-screen, silent Richard. As audience members, we're not even certain that Richard is in the crawlspace at that juncture. All the conversations are deliberately one-sided, with Albert addressing, essentially, a darkened hole. These scenes provoke anxiety, as we can only imagine what Richard is thinking while the old man addresses him. In some weird way, these sequences are also squarely on thematic point: a romanticized view of child-rearing, perhaps. The Graves believe they can allow an adult (and a creepy one at that...) into their house, and that he will obey their rules. They think they can just talk to him, and he will do what they want. Anyone who's ever raised a kid knows it doesn't work quite that easy. You can talk, but there's no guarantee your child will listen, let alone listen quietly and obey your edicts. Here, it's downright weird to watch Albert -- alone in the frame (his space restricted by the angle of the shot) -- rationalizing his point-of-view to the off-screen Richard. As Crawlspace continues Richard's unstable and violent nature becomes apparent. He chops up a local grocery store with an axe over an altercation involving a twenty-dollar bill. Later, Richard kills an obnoxious kid (again with the axe...) for that incident. At this point, Albert and Alice repeatedly urge Richard to leave their house, but he refuses. "Never. Never ever," he insists. Seems the Graves had it wrong, you see. They aren't taking care of Richard. He's taking care of them, or so he insists. "I gotta take care of you. I gotta keep you safe!" As you might guess, the Graves' unconventional attempt at parenting finally ends in disaster. When Albert croaks, "how did we get into this?," you may feel a little like laughing..or smacking your head. 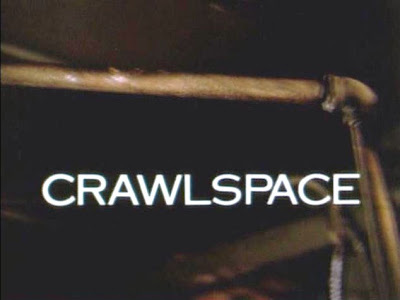 Despite the patented weirdness of the movie's plot and character motivations, Crawlspace remains a pretty tense affair, enhanced by Newland's efficient use of P.O.V. exterior shots (at night). 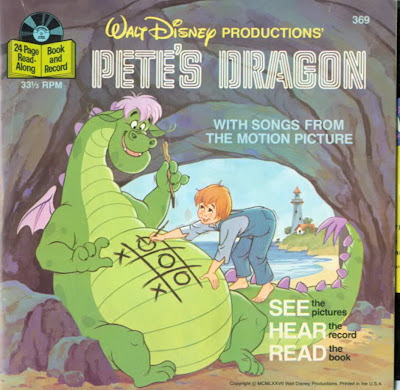 The film is lean too, mostly involving just three characters in a contained space (the crawlspace and the house above). At a running time of just 74 minutes, Crawlspace doesn't wear out its welcome, and on the contrary, may leave you feeling deeply unnerved. That anxiety arises not because Crawlspace is a movie about a psycho living in the basement, but because it's a movie about a family that encourages a psycho to live in the basement.